This is the French original of the text accompanying this article on the mosques of Tunisia. The article “Outcry Concerning The Mosques: the state crisis of confronting religious approaches” appeared at Nawaat.org, back on September 27, 2014. Nawaat.org is an informative Tunisian website in Arabic and French, occasionally in English as well. 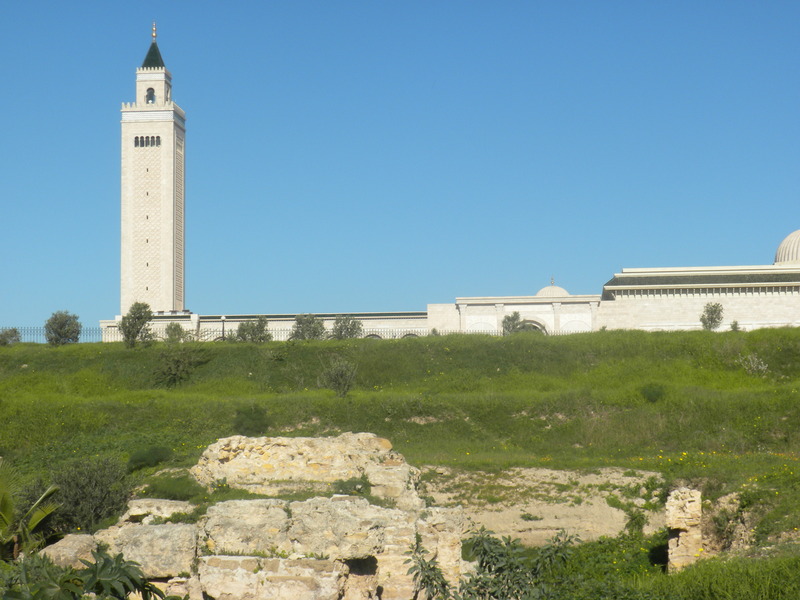 Contrary to what one might th inki, it isn’t the holy city of Kairouan (with its 391 mosques) that has the record number of mosques in Tunisia but instead, Sfax (1) (which has 524). Just after the January 14, 2011 revolution (2) more than 1000 mosques fell into the hands of fundamentalists according to a spokesperson from Tunisia’s Ministry of Interior, Mohamed Ali Aroui. He goes on to claim that 90 of these mosques were built without the proper government permits (construites dan l’anarchie) and that as of last July (2014) that 149 Tunisian mosques were declared under Salafist (3) control of which 25 are outside of the control of the authorities. Among those mosques so designated in the Grand Ezzitouna Mosque of Tunis, controled by the virulent Imam Houcine Laabidi who has re instituted the “original Zeitounan teachings” (ie – going back to the sources, ie, Islamic Fundamentalist approach). The article went on to detail the number of religious employees in the country – some 18,000 – twice that which were employed by the Tunisian state in 1988 (just after Ben Ali came to power). The budget for religious matters – some 88 million Tunisian dinars ($47.6 million) these past three years that Ennahdha has been in power exceed that allocated for women, The article continues to describe how this new crop of post 2011 religious employees are poorly paid and educated for their work while at the same time the number of mosques has exploded with some 5146 accounted for and officially registered in July, 2014, just five months ago. 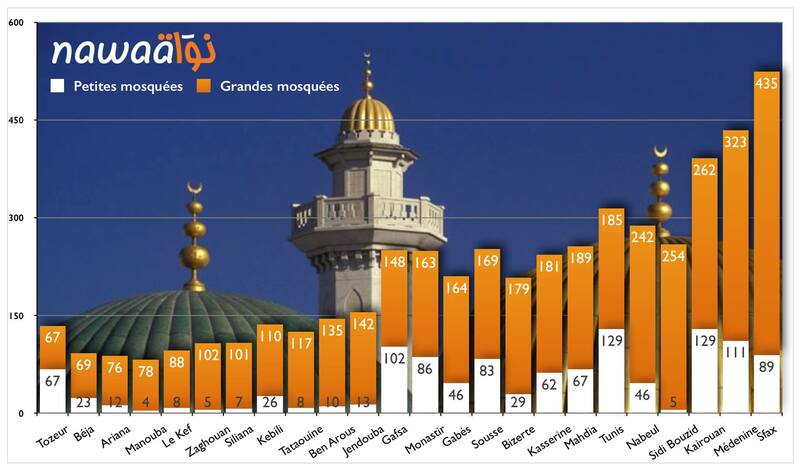 This represents a growth of some 500 new mosques since Ben Ali was overthrown. These include a number of buildings that were in the past, headquarters of the RCD (Rassemblement Constitutionel Democratique – ie Ben Ali’s only legal party) that were transformed into mosques after the dictator’s collapse. I read this article with interest when it appeared several months ago. It reflected what I saw with my own eyes during my December 2011 visit to Tunisia, ie, a growing religious offensive on the part of the more fundamentalist Moslems to take over the mosques – actually seize control – and then to use them as a platform to promote their reactionary ideologies. It happened with stunning speed, changing in many cases, what had been moderate Islamic circles into more radical, Salafist-ized centers. From these centers it was not just Ben Ali’s policies that were attacked, but the very separation of mosque and state for which Tunisia had been so well-known. It could not have been done, impossible, without the full encouragement and support of the “moderate” Islamic Ennahdha Party which was coming into its own in full strength in those days. From my vantage point, it was a disturbing – no, ugly – process to watch unfold and seemed to be growing in strength at the time. Now it is in partial retreat, admittedly, but much damage has been done. While Ennahdha had entered into a formal alliance with two secular parties to form a transitional government – neither of which had much of an actual base in the population and thus could easily be manipulated to Ennahdha’s will – their informal and very openly acknowledged alliance with radicalized Islamic circles was, in many ways far more important. It is that alliance which has broken down under both domestic and foreign pressure. More on this in later postings. 1. Sfax – Tunisia’s second largest city along the coast south of Tunis about 160 miles (270 km) from the capitol.